Women and guns are not a bad or even an unusual combination. Women are frequently taught to use appliances such as stoves, microwave ovens, convection ovens, curling irons, irons, sewing machines, and other household items that can be deadly or dangerous in the wrong, untrained, careless, or distracted hands. My first encounter with an iron has made me cautious and wary of them. I never trust that it is cool unless I have checked it myself firsthand. You may be asking, ‘How are sewing machines dangerous?’ A finger in the wrong place can cause the needle to sew through it. Past personal experience reminds me that irons and sewing machines are dangerous to my own hands. There are other household tools that women should be taught to handle with respect as well. These tools are for self protection. Guns are tools that can be used to protect and defend. Guns should be handled with respect and care. If you are not afraid to cook, you should not be afraid to handle a gun because stoves can cause fires that can set the house on fire and kill anyone inside; yet many of us – female and male– cook on a regular basis without incident. It is in the ‘knowing how’ that takes away the fear. Guns that are mishandled or in the wrong hands are dangerous and deadly. Understanding that the gun itself should not be feared is the key concept that must be taught to all who are afraid to touch a gun. Gun safety is the most valuable lesson anyone, male or female of any age, can learn. Growing up with guns in our home helped me become familiar with this particular tool. They were not locked away in a cabi net. I was taught from a very young age that guns were not toys. I was involved when the guns were being cleaned, oiled, and checked regularly to ensure that all were still unloaded. All of the adults in my family made sure that all of us youngsters (girls and boys) understood that guns were not toys, but tools. Having good female role models who are excellent sharpshooters eliminates the stereotypical thinking that guns are just for men. My mother has always been an Annie Oakley type sharpshooter. She grew up in the South in a rural area where it was expected and customary for everyone to handle firearms for hunting and home protection. My mother-in-law has had a concealed carry permit since before it was “cool”. Accuracy counts in game hunting; but I was taught that a weapon fired toward and near a threat (an on purpose miss) can be effective in scaring away an intruder in the woods as well as in a home. However, you should be prepared to destroy or kill anything that you aim toward. My dad’s rule of thumb is mine as well: If you do not intend to pull the trigger, do not aim the gun with it loaded. If someone is trying to kill, harm, or attack you or a family member, having a gun on hand and being comfortable enough with it to use it without hesitation can be the difference between life and death. Women should always be well-trained in self defense. Guns are just one tool to be used for personal protection. Pepper spray, Tasers, and knives must be used at close range. Guns allow women to take charge of a situation and put distance between the assailant and herself. I never recommend shooting to kill unless it is clearly the only way to spare your own life. Calling 911 and wounding an attacker is a better option. A well placed, accurately aimed bullet will most likely stop the attack until the authorities arrive. Girls are often stereotypically not taught to use a gun until after they have been in a situation where they would have benefited from having a gun on hand. The old saying of ‘shutting the barn door after the horse is out’ applies in these situations. It is a little too late to stop what already happened, but you can be ready in case you are faced with a next time. My husband (a former law enforcement officer) and my father-in-law (a retired police chief) recommend that all ladies be trained and armed for personal protection. They have seen many instances in which a gun-toting woman (with either a shotgun at home or a handgun downtown) would have been a survivor instead of a statistic. Give yourself and your loved ones peace of mind. Let them know that you are fully capable of taking care of your personal safety at home or at the mall. Handling firearms should be as normal as handling a cell phone. Both can be used during a crisis. Knowing that you can take care of yourself is empowering. If you have felt helpless and victimized, learning to handle weapons can restore your confidence in yourself. There is no reason to fear the gun when you are the one handling it. Take the tool into your own hands and protect yourself. 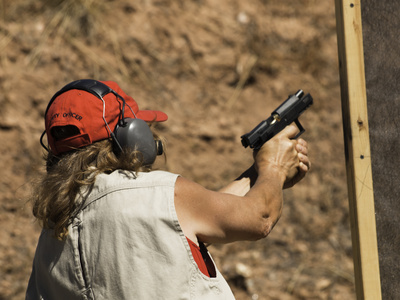 Let us know in the comments what considerations you think there are (or if any) for women and guns.